Each year, at exactly this time, begins a Thanksgiving cooking blitz that doesn’t end until Thursday afternoon. I know of people who prep much earlier in the week but I’ve never gotten into the habit. It’s due in part to procrastination and partly my fear that a dish would no longer be at its best on Thanksgiving if prepared too early. Or maybe I just need help with time management! Over the years, I’ve settled into a routine. I get up early to put the turkey in a large oven while the side dishes are prepared in a smaller oven, a steady stream of activity that keeps the kitchen warm all morning. My menu consists of traditional holiday offerings: Roast turkey, ham, yam and apple casserole, mashed potatoes and gravy, roasted veggies, cranberry sauce and sometimes stuffing. I prepare most of the traditional Thanksgiving dishes while my family comes to my home bearing even more food, mostly filipino main dishes and other sweets. This holiday and Christmas are the two holidays I look most forward to since I know I’ll be with my family. My parents, sisters, cousins, aunts and uncles, nephews and nieces–it’s a given that we’ll all be together and as I get older I realize how special these times are. Family time. It’s #1 on my things-to-be-thankful-for list. But before all the craziness tomorrow afternoon, I’ll be baking until late tonight. I like to have at least one pumpkin dessert each year but I don’t limit my offerings to pumpkin pie. I have fun changing things around a bit so why not pumpkin and chocolate together? I found a butternut squash-chocolate brownie recipe that is served at the Carneros Inn. I thought that if it’s good enough for the beautiful Napa Valley retreat, it would be good enough for me and my family. I did take some minor liberties with the recipe but I’m confident I did not compromise the integrity of the original. As promised by the recipe, these brownies were ultra moist with a nice chocolate flavor. But I also detect a very slight earthiness thanks to almost two cups of pumpkin, making these almost an almost guilt-free indulgence. And the texture? These brownies are not dense like most brownies I’ve made. They still have some heft but they’ve got a spring in their step, like a heavy sponge-cake. Definitely not like any other brownie recipe I’ve tried before but also a keeper. Thanksgiving can’t come soon enough! Happy Thanksgiving to you all! May your Thanksgiving be abundant in not only good food and drink but also in love and joy with friends and family. Note: If you decide to use fresh butternut squash or pumpkin for this recipe, please click the link above for directions. Preheat your oven to 350ºF. Lightly butter a 9×13 inch baking pan and line the bottom with parchment paper. Butter the paper. Over low heat, melt the chocolate and butter over a double boiler, stirring frequently, adding the unsweetened cocoa powder near the end. Set aside and let cool slightly. In a large bowl, beat the eggs, sugar, vanilla, and salt at medium speed. After two minutes the mixture will become pale and thick at which time you will need to beat in the melted chocolate and the pumpkin puree. Finally, beat in the flour and baking powder at low speed. Pour the (very thick) batter in the prepared baking pan and bake for 25 minutes or until a toothpick inserted in the center comes out clean. Transfer the pan to a wire rack to cool before cutting and serving. This recipe yields 12 large squares or 15 normal-sized brownies. This can also be made ahead and stored in an airtight container for three days. I love that you made something other than the tradition pumpkin pie because those brownies look incredible! I can’t get over how gorgeous your photos are, just stunning. I love pumpkin and chocolate together and I will definitely be trying out your recipe, thanks so much! 🙂 Have a happy Thanksgiving tomorrow! These look SO fudgy. Yum! 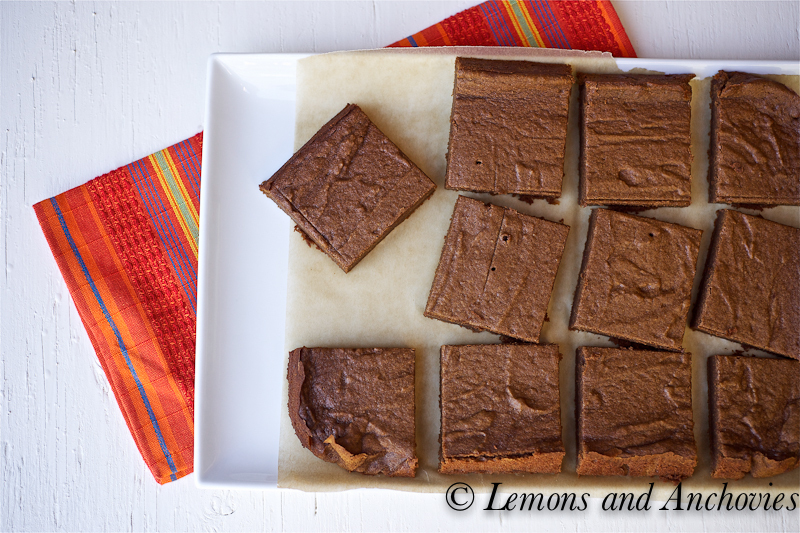 I bet those pumpkin brownies are going to steal the show tomorrow! They do look delicious! and who doesn’t like getting there veggies while indulging in chocolate! have a great thanksgiving my friend! happy thanksgiving to you and to your family… indeed you have so many things to thank for, especially having your family near you this time of the year! Holy moley, those look amazing! Great job! my mouth dropped when i saw this picture. these sound so good! I love the idea of pumpkin and chocolate together! 🙂 Happy Thanksgiving to you too, Jean. Have a great time in the kitchen today and a wonderful dinner with your family. Spending time with family truly is special. 🙂 Cheers! Happy Thanksgiving to you and yours! 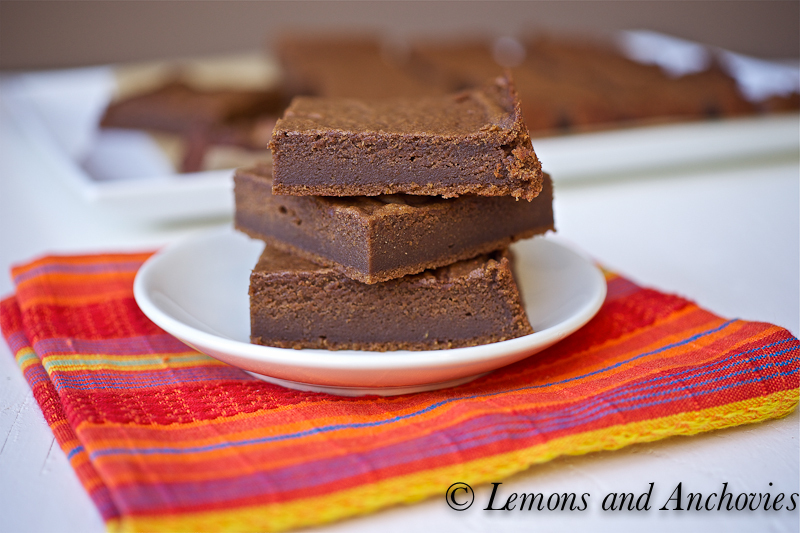 The brownies look so good…I’ll have to try it! Why not chocolate and pumpkin together? Touche. I like how it bakes a lighter brownie because regular brownies are a bit too dense for me. So that’s what you were baking late last night. Have a wonderful holiday. Enjoy family time. Happy Thanksgiving! 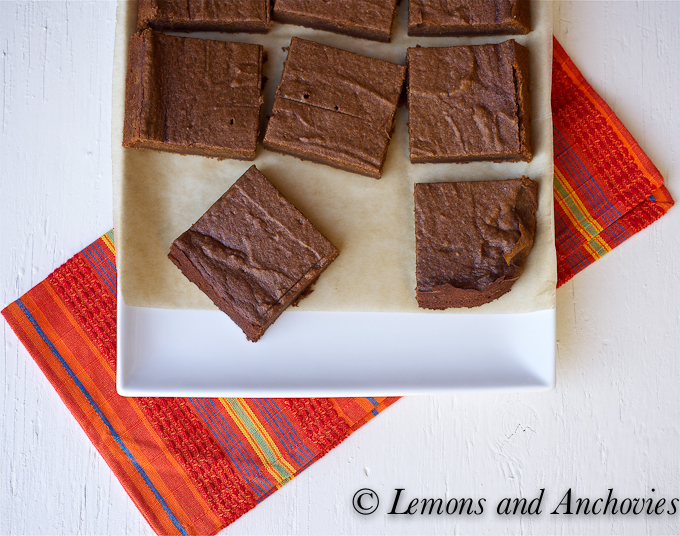 I just love these brownies – I’m always looking for a new pumpkin dessert to try each year! And I’ve got an extra can of pumpkin…. Happy Thanksgiving to you and your family and congrats on Top 9. This will be an item on my Christmas menu. LOVELY! Now chocolate and pumpkin is something I had never thought of !! i absolutely have to try that..Thanks for the idea!! They almost look like fudge! So chocolatey and I’m sure extremely delicious.. I was heading over here anyway and then I saw you made Top 9 as well 🙂 Congrats! Hope you had a fabulous Thanksgiving.. have a good rest of the weekend! These do look divine…thank you for sharing…such a beautiful job with your photographs! I love brownies and I love pumpkin, so I would have no problem devouring at least a few of these! I hope you had a lovely Thanksgiving. Have a wonderful holiday weekend! What an Original Thanksgiving recipe! . I would like to present you with the “One Lovely Blog “Award. Please drop by my site to pick it up when ever you are free. Beautiful pictures and the brownies look amazing! Perfectly sticky and creamy, mm. BTW, our new mixer got a workout and we love it!! Congrats on Top 9! And I love your brownies, a great way to use pumpkin. I hope you and your family had a wonderful turkey day! bookmarking! 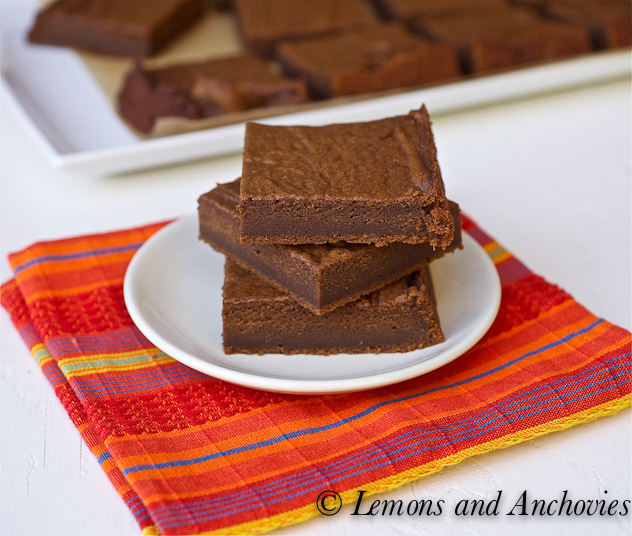 pumpkin and chocolate sound like a good combo for a brownie! hi, can you tell me how many grams or ounces a stick of butter is? being from the UK a ‘stick’ of butter doesnt exist here and i cant find a sure conversion. Hi Maria, I’m sorry I missed that. One stick of butter is 4 ounces, 8 tablespoons or just slightly over 113 grams. Hope this helps! Dennis loves chocolate and pumpkin… this is the perfect sweet treat for him!! I am so making these! Thank you for your lovely note in my blog. I hope you had a wonderful Thanksgiving, Jean! I was going to say that I hoped your Thanksgiving was wonderful and delicious but I really don’t need to, because I know it was both! These brownies sound so neat – I would never have thought to put pumpkin in brownies but now I’m very intrigued. Thanks Jean! Pumpkin and chocolate! Certain seems like a marvelous way to use up all that extra pumpkin puree.